Wall Mounted Padded Seat Compact and foldable. This wall mounted, padded shower seat folds back against the wall when not in use. It's quite small and won't take up too much room in the shower cubicle, so users won't feel crowded or constricted. 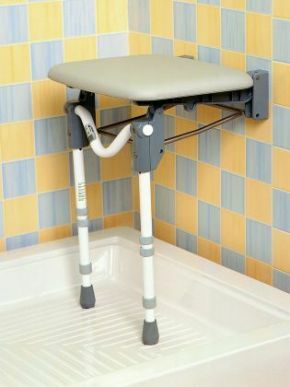 The legs are adjustable in height and available in two length options- the longer one is ideal for those who want a very tall shower seat. The frame is made from stainless steel and aluminium components for corrosion resistance and the seat is pleasantly padded for seated comfort.